For location & directions use the Google Maps application located on the map at the bottom of this page for print ready directions. Click directions and simply fill in your address and we’ll see you at Camp. Please do not use Apple Maps to get to camp. The Apple map app has been leading people to an incorrect address. 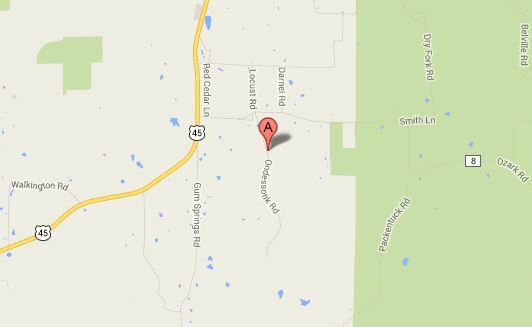 Camp’s Address is 3760 Ondessonk Road, Ozark, IL 62972. Camp Ondessonk is located just east of Illinois Route 45, on Ozark Road, near the town of Ozark, IL. Ozark Road intersects Route 45 at the Ozark General store. This Intersection is 12 miles north of Vienna, IL, 2.7 miles south of New Burnside, IL, or 20 miles south of Harrisburg, IL on Route 45. A brown department of transportation highway sign marked “Camp Ondessonk” and “Bell Smith Springs” marks the turn from Route 45. From Route 45, take Ozark Road east one half of a mile to Ondessonk Road (look for the camp gate on right). Make a Right on Ondessonk Road. Turn right onto Ondessonk Rd.